Source of title proper: Title based on name of collector. 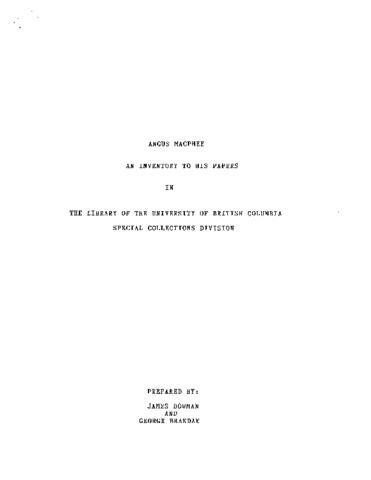 Angus MacPhee enjoyed a long period of union activity, mainly in the Prince Rupert area prior to the formation of the Pulp and Paper Workers of Canada in 1963. He served as first Vice-President of the national organization from 1964 to 1967 and Secretary-Treasurer from 1968 to 1969. The organization changed its name to the Pulp, Paper and Woodworkers of Canada in 1971 and he became the business agent and national board member for Local No. 4. MacPhee served as national president from 1977 to 1982. The collection consists of records of the International Brotherhood of Pulp, Sulphite and Paper Mill Workers Local 708 (Prince Rupert) including correspondence, circular letters, press clippings and publications. Records of the Pulp, Paper and Woodworkers of Canada include convention material, national executive board minutes, constitutional material and correspondence. In addition, MacPhee collected a series of constitutions of labour organizations and collective agreements, primarily from the forest products industry. The collection also includes correspondence, minutes and constitutions of the Western Canada Council of Pulp and Paper Mill Unions and of the Prince Rupert Labour Council.